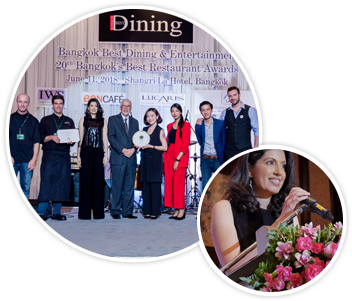 The 20th Bangkok’s Best Restaurant Awards was held at the Grand Ballroom of the Shangri-la Hotel on June 11, 2018 . This staged event, a multi-venue dining and entertainment ceremony featured 40 venues, live band performances and awards presentations. Without a doubt, and regarded by some, as one of the major highlights of the Bangkok social calendar, the event is attended by more than 1000 guests constituting dignitaries, the cream of the business community, the hospitality industry plus well-heeled society regulars. It is a great amalgamation of various venues and cuisines under one roof featuring their best from decor to provision of gastronomic delicacies for guests to savor. Each year the excitement of this event is heightened; a gourmet banquet is laid out by some of the finest restaurants in town; drinks and entertainment are provided by the best bars and clubs - entertainment this year was provided by Ms. Nikki Kidd and the Trio band from Bamboo Bar ; Quest- from Spasso at the Grand Hyatt Erawan.